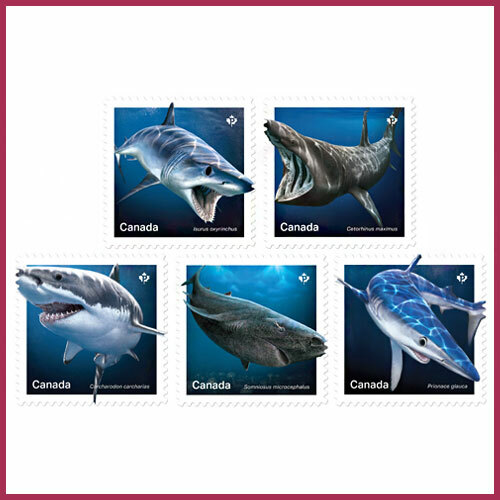 New stamps were released by Canada Post this week featuring five sharks that are commonly found in all three oceans that surround the Canadian coast. Sharks depicted on the stamps include Greenland shark, basking shark, blue shark, mako shark and the great white shark. Researchers believe that sharks have been on earth even before trees and have adapted to various conditions in the ocean. The increasing oceanic temperature is a big threat for Sharks now. They are also mistakenly caught in fishing gear due to overfishing and byfishing. Sharks like the great white shark are migrating to unknown waters due to changing ocean conditions. Some researchers think that they might reach Canada’s Arctic in a few years. They are also able to shift to a new location within a short time depending on suitable ocean conditions. Great white sharks do not visit the Canadian oceans frequently but blue sharks, basking sharks, and Greenland sharks are commonly found there. Migratory blue sharks feed mostly on fishes like herring, tuna, and swordfish, which is why they are accidentally caught in fishing gear. Basking sharks are gentle in nature and feed on plankton. They were hunted to such a large extent that they were almost extinct in the 1900s. Quite a few of them have been spotted by researchers recently in the Pacific ocean which is a positive sign. Greenland Sharks are hard to spot and are found mainly on the eastern side of Canada’s Arctic. The predator can live up to 500 years according to experts.